This week we are getting to know more about Tyler Holtzman, the highly revered mentor from 2056 OP Robotics. He's been involved with FRC for more than 10 years and previously mentored 1114 Simbotics before joining 2056 OP Robotics as one of their founding mentors. 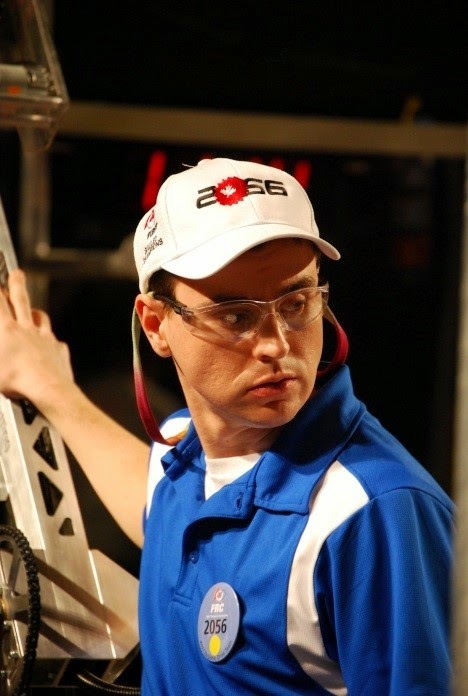 He has numerous years of FRC experience that helped him build up 2056 to the powerhouse team that they are today. With his help, OP Robotics have won every regional they have competed in since he has joined the team. FIRST has had a large impact on Tyler Holtzman’s life by giving him his first full-time job that he continues to do today. 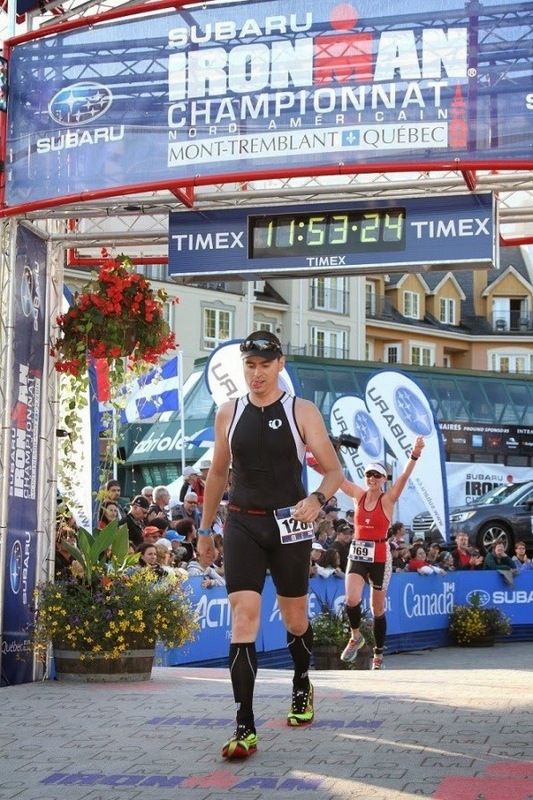 Even as he is heavily involved in the FRC community, he lives a balanced life that allowed him to train and participate in the Ironman Mont Tremblant in August of 2014. Be sure to read to more about his story and advice in the rest of the article and learn how a great mentor works. Growing up, I was always playing with machines. I liked tractors, Lego, and was always building things and helping my dad in the garage. I built my first 4 bar when I was 6. I got into rock climbing when I was 10 and did that for a few years. I got into cycling when I was 15. It started off as mountain biking, and then road racing. I did that through most of high school and was fairly successful. I won the Provincial Championship a couple times, and won some big races in the States. I learned a lot of valuable life lessons racing that have stuck with me for the rest of my life. If you want to be truly successful at something, you have to make sacrifices. This is true in design, and engineering, as it is in life in general. I didn’t have much of a social life in High school. My schedule went something like go to school, come home, go ride till it was dark, then homework and bed. The other thing I learned was that going to races isn’t the fun part. Training isn’t the fun part. Winning is the Fun part. This kind of competitive spirit must be tempered with modesty, and grace. I don’t care for boastful attitudes, and prefer to be let my actions and achievements speak for me. There is no shame in losing to a better man, provided you gave your best effort. To be great, truly great, you must have the drive, commitment, passion, a fire in your belly that sets you apart from the rest. Regardless of what you choose to do in life, give it your all, and you too will be truly great. In my 2nd last year of high school, our tech teacher told us we were starting a Robotics Team. I got hooked our first year, but it wasn’t really until our second season that I began to apply my competitive spirit to robotics. My focus shifted away from bike racing, and stayed firmly planted on FIRST for many years to come. After graduating high school, I stayed active with the team travelling home on weekends, and building offseason prototypes with 1114. In the fall of 2006, I heard that a new team was starting not far from where I was attending University. I agreed to come by a few days a week and lend a hand. A few days a week soon became every day of the week, and 2056 was born. 2007 I pulled double duty with FRC 1114 and 2056, but 2007 would be my last season actively involved with FRC 1114. I led the VEX team at 1114 until 2009 when I started working full time. I led the design effort and was field coach at 2056 up until the 2014 season. I work for small automation company called Jantz Canada. We are a systems integrator for Kuka Robotics, and I am responsible for all robotic applications here. We focus primarily on Palletizing applications for the food industry. A customer will come to us with an application they would like automated. I’m responsible for coming up with a viable solution, and helping to price out what we think the job will cost. If the customer chooses to buy the system, then I lead the detailed engineering design of all of the components in the system. We have in house fabrication here, so I keep an eye on the fabrication. We set up and test the system before we ship. Make whatever revisions we need to, and then ship it. Once the system is onsite, I travel there to oversee the startup, and to train the operators on how to use it. Thankfully, we’re a lot better at making robotic systems than we are at making videos. How I got there is an interesting story. In fall of 2009, one of our students at the time approached Jantz Canada as a potential laser cutting sponsor. They agreed, and provided laser cutting and bending for us for the 2010 season. On the Thursday of the 2010 Waterloo Regional, I got a call from the GM at Jantz asking me how our season was going, and what my current employment status was. At the time, I was recently graduated from McMaster, and was planning to start looking for work after The Championship. They hired me right after Champs in 2010, and I’ve been there ever since. 2012 was an interesting season for 2056 for a number of reasons. Our first event was marred with controversy. Our second event was relatively uninteresting, but at our third event, we were forced to cross a bridge I would have rather not crossed. We had to play against, and ultimately defeat 1114 at a regional. The Archimedes finals of 2012 were the most satisfying victory of my FIRST Career. After being forced to play against 1114 in regional competition, we were able to select them with the 2nd overall pick. Following the release of the Divisions, we had stepped up our practicing with 1114. Both 1114, and 2056 underestimated how important Triple Balancing was that season, and both built long robots. This made tripling together almost impossible, unless we had a 20” robot in between us. Knowing this, we had built a short practice drive base the size of 4334’s robot to practice Tripling together prior to the championship. When we were able to select them in the 2nd round, we knew we had put together the special kind of alliance you need to go to Einstien. We advanced to the finals against Wave and HOT. Wave was exceptionally good that year, and HOT was the best triple balancing robot that season. They were a fantastic alliance, but hadn’t been able to nail the Triple Balance that had been HOT’s signature move throughout that season. In the first match, our alliance nailed our triple, but Wave really lit it up, and we lost by 3. The 2nd match, we kept it closer on balls, and hit our Triple to win the match. The third match was back and forth. Blue leading by 3 after auton. With 30s to go, we were tied, and 1114 lost Comms. Hot hit two more balls, to take the lead, and we hit two more to tie it up with 20s to go, as all 5 live robots go to balance. Just as we peel off to balance, our Human player hits a 2 to take the lead. After losing the 2nd match, The HOT Wave alliance tried for a Triple that had eluded them throughout the Elims thus far. After balancing for a couple seconds, wave tipped off the end, they quickly reorganized, and attempted again looking like they had it for good. We double balanced with just seconds to spare, and I looked over at the opposing bridge with three robots balanced but just as the buzzer sounded, they tumbled off the bridge, and we had the win. And that’s where I end that story. Unfortunately we went to Einstein, and some stuff happened, but that’s a story for another day. Why do you compete in FIRST? I’m a firm believer that in FIRST, you get out what you put in. I’ve often thought that I focus too much on our performance on the field. That focus has provided me with the skill set required to be an effective engineer and I’ve never had to look for a job a day in my life. I try to instill that passion for success in our students, and couldn’t be more proud of what they’ve accomplished. I continue to compete because I enjoy the competitive aspects of it, and the comradery that goes along with it. I have the utmost respect for the other Powerhouse teams. I enjoy going around the pits, chatting with other mentors and hearing their stories about how they come to their solutions. FIRST has been around long enough that there are quite a few of us “Lifers” around now; Guys who’ve been in it for 10-15 years, and continue to come back year after year. I’ve come to call many of these my friends, and enjoy competing with and against them. I don’t really get a lot of enjoyment out of winning regionals anymore. People ask me what it’s like to carry the streak on your back, but to be honest, I don’t even think about it anymore. After 6 when we broke the record, it was a big deal, and we celebrated and got hats made with the 6 on it. Now I’ve got a stack of hats at home and only one head. IRI is my favorite tournament, but the Championship has become my “White Whale”. This was the first year I wasn’t actively involved in 1114. I first saw the machine in action right before ship that year and was completely blown away by it. I knew immediately that they had a winner, and the rest is history. My home and work desks are fairly similar. I spend most of my day at my work desk. It’s all about efficiency for me. I use dropbox to sync files at home, work, and the school. I custom build all the CAD work stations at our office. They’re purpose built for Solidworks, and run it fairly well. 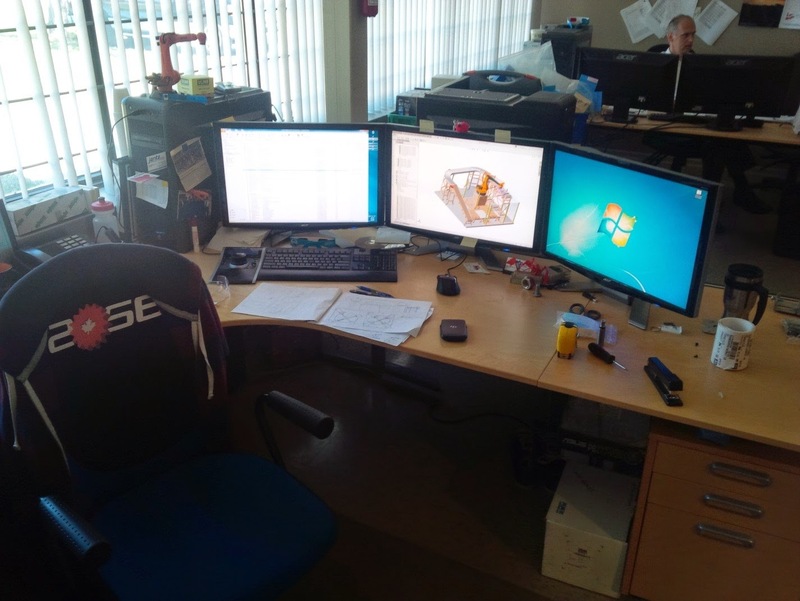 I have 3 24” Monitors at work, and use a space mouse for CAD work. I prefer to work in silence. It’s varied a lot over the years. 2007-2012 seasons, it went something like. We do a lot of fabrication at the school, so I try to be there as much as possible while we have access. We are limited by the school custodians as to when we can be in the school. My dad is a retired machinist, and has a machine shop in his garage. I often help him with machining on weekends, or after official team hours. I’ve got CAD workstations at home, work, and at the school that all have dropbox to sync the models across. I do whatever I can to make it as easy as possible to be productive. I find it that too often, people put up barriers and make excuses why they can’t do something. I don’t know that I’m better than everyone else at one thing. I have a very good long term selective memory. I subconsciously file memories into two categories, things I need to remember, and things I don’t. Take care of the little things, and the big things take care of themselves. Fill in the blank. I'd love to see Travis Covington from 254 and Michael Corsetto of 1678 answer these same questions. I mentioned earlier that I led the design effort until the 2014 season. My time with 2056 has had many successes, except for one. The 2012 season came within what felt like inches of a World Championship. Having that taken away from us the way it was a tough pill to swallow. The single largest effect had on me was adding fuel to the fire within me, that’s been on the verge of burning out of control for many years. I took on 2013 with an attitude and drive that was unsustainable, and my health suffered as a consequence of that. Our 2013 machine was very good, and I’m extremely proud of it, but the 2013 season really took its toll on me. After the 2013 season, I knew that I needed a break from FRC. 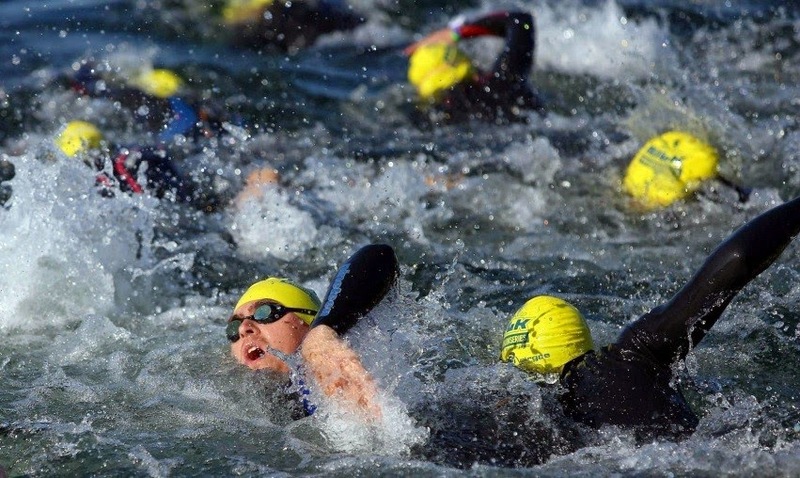 I had always been interested in Triathlon, and my background in cycling made at least one of the disciplines seem possible, so I decided to register for Ironman Mont Tremblant in August of 2014. I’ve never been one to start small, and I had already competed in a couple of shorter Triathlons in 2012 so this seemed reasonable. Knowing this would consume a good chunk of my time, I asked my most trusted alumni Trevor Kearse (strategy lead 2007­-2013) to take over the design effort. He along with several other key alumni are largely responsible for 2056’s on field success in 2014. Zac Young (Operator, Human Player 2007­-2010) stepped in as field coach, and I have to admit, I think he was a better coach than I ever was. My involvement was greatly reduced, and I was able to put in the time required to complete the race this past summer. I have to thank these guys, and everyone who contributed to our team’s success in 2014. For 2015, I’ll be increasing my time commitment over 2014, but not to the insane 2013 levels. Balance is important in life. Some of us just choose to balance the scales a little more off­center.